Many adult women are taken by surprise when they suddenly begin to develop symptoms of allergic reactions they have never before experienced. The causes of newly-developed allergies in adulthood are not yet fully understood by scientists; however, there are some often-debated theories. Keep reading to learn a few of the reasons why allergies might develop during adulthood. It is thought that one of the primary causes for the increase in allergies appearing in adulthood are actually related to factors from a much younger age. With each subsequent generation of babies, children are subjected to fewer and fewer allergens, such as dust and grass. It is believed that this can make these babies more vulnerable to developing these types of allergies when they reach adulthood. Unfortunately, growing older can lead you to be more susceptible to developing allergies. Repeated exposure to certain allergens can cause an eventual allergic reaction. Therefore, it stands to reason that as you grow older and have encountered allergens such as dust, dander, mold, and pollen more frequently, then you have an increased chance of developing an allergy to them. Genetics is one of the causes of allergies that cannot be changed. Although allergies are not always directly inherited, if your immediate family members suffer from allergies, then you have an increased risk of developing those allergies too. In fact, if one of your parents suffers from a specific allergy, you have a one in three chance of developing it as well. Sometimes, what may seem at first like an out-of-the-blue flare up of allergies during adulthood is actually an old allergy that has lain dormant since childhood. However, if you have no recollection of suffering from the allergy as a child, then you will be unable to separate whether it is a recurring allergy or a completely new development. You should also consider the way in which environmental changes can affect or cause new allergies. If you have recently moved to a new area that you have not spent a lot of time in, the exposure to different varieties of pollens, dust, and foods can provoke a previously unknown reaction. 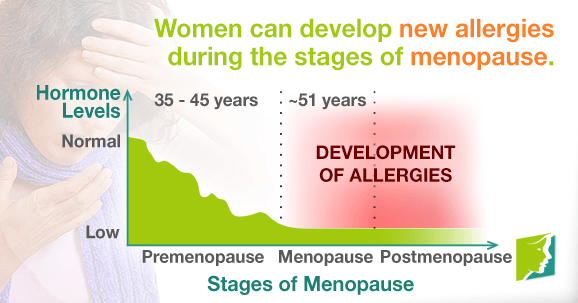 During menopause, hormone levels fluctuate in preparation for the transition. Decreased levels of estrogen can also have a negative effect on the immune system, making women more susceptible to allergic reactions. If a woman develops new allergies due to hormonal changes, she may wish to treat the imbalance by making lifestyle changes or using herbal supplements. Allergies can flare up at any stage during a woman's life, but they can be difficult to cope with if they appear in adulthood without any previous warning. Fortunately, there are things that can be done to relieve the frequency of severity of symptoms. The first step to helping allergy symptoms is to understand why they might be occurring.